A Nonprofit Extends Voter ID Work Post-Midterms: Why? 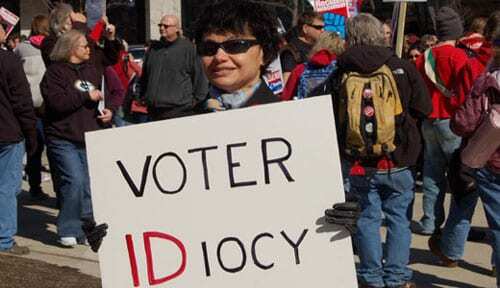 peoplesworld / Voter ID, or Voter IDiocy? Last Tuesday, more than two million North Carolina voters, 55 percent of the total, said “yes” to a state constitutional amendment that will require people to present a valid photo ID in order to vote. An earlier attempt to impose the same requirement through legislation had been ruled unconstitutional by a federal court, prompting North Carolina’s Republican-dominated legislature to place the measure on the November ballot. Just days after the election, a recently formed nonprofit, Spread the Vote, announced it was springing into action to make sure this wouldn’t keep eligible voters from participating in the next election. Voter ID requirements are one of several contentious efforts to suppress votes. Thirty-four states have some kind of voter ID law in place, with 22 requiring a state-issued form of identification. The stated rationale is that ID prevents fraud and qualified voters can easily meet the requirements. Opponents see it as a solution to a nonexistent problem and one that’s really designed to limit the power of the poor and communities of color, for whom the cost and difficulty of obtaining the necessary documents present a high barrier. The voter must gather documentation—things like birth certificates, naturalization papers, social security cards, marriage certificates for women who have changed their names, and proof of residence. Original copies are usually required, which can cost money to obtain. The poor face the challenge of paying for all this paperwork. The homeless lack the residential address required to register. Elderly voters who were born in rural areas may have never been issued birth certificates, and must make their way through an endless bureaucratic maze in order to prove their identities. Students and young voters may find their dormitory addresses are not accepted. Native Americans who live on reservations may find that PO Boxes are not accepted either. The challenge that Spread the Vote has taken on is large, and their 2018 results were quite small. According to Fortune, the organization “spent $770,000 this year to help more than 600 voters in Georgia, Texas, Tennessee, Virginia, and Florida obtain IDs.” For 2019, they have set an aggressive goal of getting IDs for 10,000 voters and are expecting to spend more than $3 million in that effort. The Virginia election saga continues, with the 94th District vote, which had appeared to have been won by the Democratic candidate, Shelly Simonds, declared a tie. Control of the Virginia House of Delegates might now literally depend on the toss of a coin.